You have a contractor lined up to install new siding on your home, but you feel like you're forgetting something important. Could it be that someone once mentioned the ideal time to cover your house's fascia trim is during a siding installation? Many older homes have wood fascia that requires regular repainting to prevent moisture damage, but there's one slight problem--in many areas the trim is almost impossible to reach because the gutters are in the way. Covering your fascia during your siding installation can put an end to the problem once and for all. How often do you have to paint your home's fascia boards? Depending on where the house is located and the paint used, it could be as often as every five years and almost certainly at least once every ten years--after all, the trim is a big part of your home's exterior appearance. According to the R.S. Means Repair & Remodeling Cost Data guide, a painting contractor might charge about 80 cents a linear foot to put one coat of paint on your fascia and that doesn't include removing and replacing the gutters--even on a very simple house with just 320 feet of fascia your total costs could easily be about $500 every five to ten years. 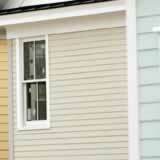 Ask your siding contractor for a bid to cover the fascia boards on your home--it may be less than you think.